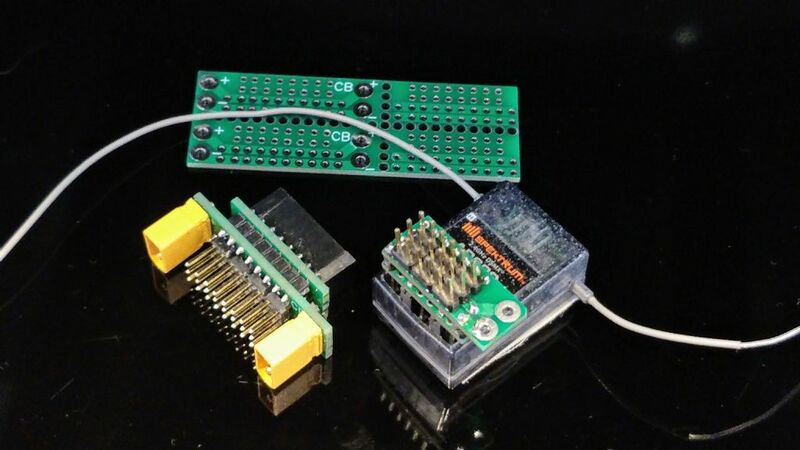 Have you ever worried about supplying your Rx and all your servos with power using one flimsy servo plug rated at best at around 5 amps? But then maybe your model's requirements really don't deserve the expense (and size/weight sometimes) of something like a powerbox. Spektrum certainly thought there was a gap there when it came up with it's powersafe receivers. These have decent sized cables with decent sized connectors for connecting in your chosen power supply. So what can anyone not using a powersafe receiver do? I've been mulling this over and have come up with these. They are prototypes really, just to test out the concept. I'd be really interested in any perceived pros or cons anyone can come up with. I have a few in mind already myself. 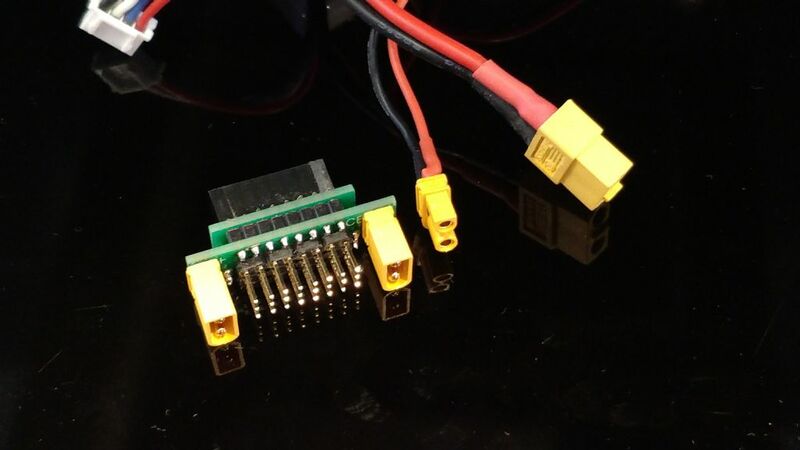 The idea is that power connects in through some decent sized connectors or directly soldered wires straight from a switch or a good UBEC. Good sized PCB tracks carry the current direct to the servo ports while the signal pins connect straight through from the Rx. At the moment, on the dual supply version, both power sockets connect in directly. Is this the best way to do things? Anyway - any and all thought will be very welcome. Even if we conclude that it's all completely pointless. Oh, and ideas how to make some sort of case/enclosure would be welcome too. I can see where you are going with this Chris. The 6 channel single supply version looks as though it just needs a single XT60 (or alternative) to allow it to be capable of fitting most 6 channel receivers. Assuming that the PCB tracks are heavy enough to carry the current required by 6 heavy duty servos, I see all pros and very few cons. One question though - why have you applied power to the receiver through channels 2 and 5 rather than 1 and 6 ? I share your reservations about the 8 channel dual supply version. 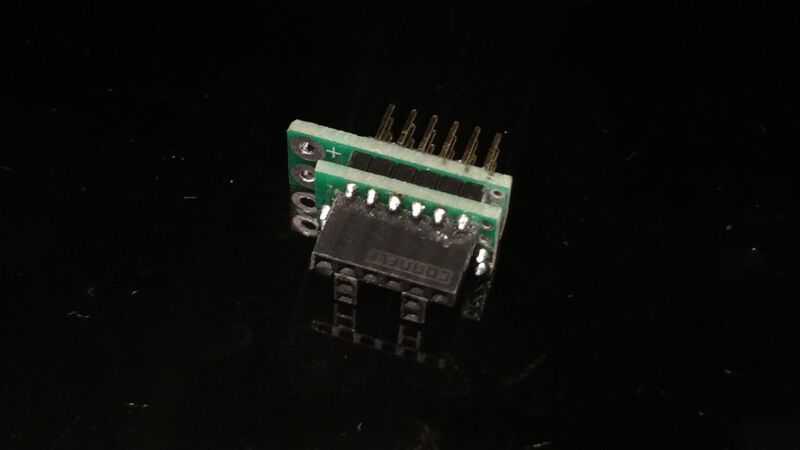 This allows simple parallel connection of two batteries (via separate switches maybe) giving a form of power redundancy, but if one battery goes short circuit or low voltage, it will drag the other down. Maybe something a bit more refined is needed? 1 articles Thanks for the comments Gary. At this stage I thought I'd keep it as simple as possible. A couple of diodes could easily be added in the battery feeds to this unit, then later be incorporated into the design if that turns out to be the right thing to do. The yellow connectors are XT30s. I can easily solder one into the single fed unit. Or I may well solder in the wires from a 10A UBEC. One nice addition might be a 5v regulator for the Rx. 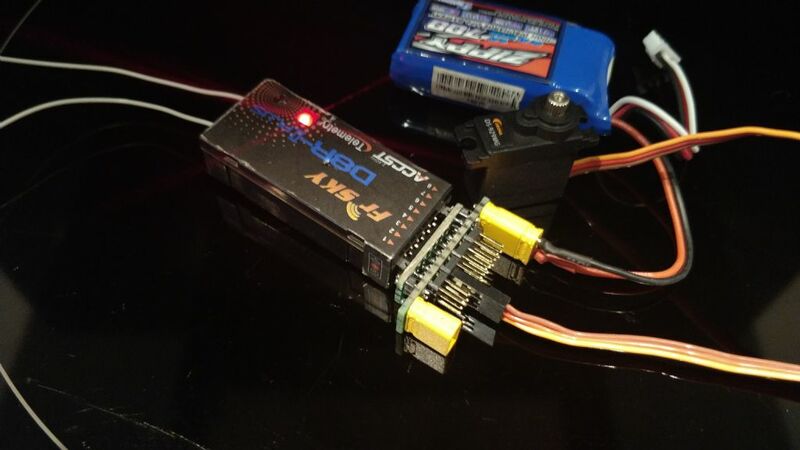 So that high voltage servos could be used with a Rx that can only tolerate a 5v supply. That's very neat work Chris! I'm always in awe of anyone who can solder that neatly. I would think it would be fairly easy to get a case made up by 3D printing? However, in my experience this is a problem that doesn’t exist. Plugging two batteries into the receiver, with std plugs, is very common and I am not aware of any issues? This is the method I use on most of my models, and I have never read about plugs melting..
3d printing, yes great idea. I just have no skills in that area or a printer. Good, so plugging in two batteries is probably OK.
Plugs melting has never been an issue, I agree. But this would require a sustained high current and we don't have that. What I think we do have more and more are high intantaneous currents. These come from using more powerful servos, often digitals that promise great holding power. A breif high current can really "find out" any connection with a little bit of resistance in it - our tiny servo plugs maybe? The result is a breif drop of voltage - to everything. What we do hear about are unexplained losses of control. My bet is that some of these are down to breif dips of receiver volts. This might even be exacerbated after a Rx reboot by excessive stick waggling trying to pull off a recovery. I don't know. You might be right. This could just be a solution looking for a problem. Good idea and practical when can we order some! Only a thought as I am in the middle of making a loom and considered this. Dual supply split rail so RX,Thro,Aile,Elev and Rudd on one supply, all other channels on the other supply that way if the gear servo stalls it won't brown out the RX. Could get clever and have dual supply with split bus (and diode facing RX side) that way if the gear servo stall its only going to drag that side down, but if the RX battery fails it would all keep going. Love it Chris. I'm running a standard 4 channel hack model with a small petrol engine ignition from a single LiFe with a homemade voltage reducer (with smoothing) and I've always thought the standard connectors are outdated. I use 0.35 mm sq conductors and this is a pig to crimp into the standard plugs/sockets. Thanks for the encouragement gents. SR71 - these should fit all types of receiver. Pics below show a few from my unused Rx box. 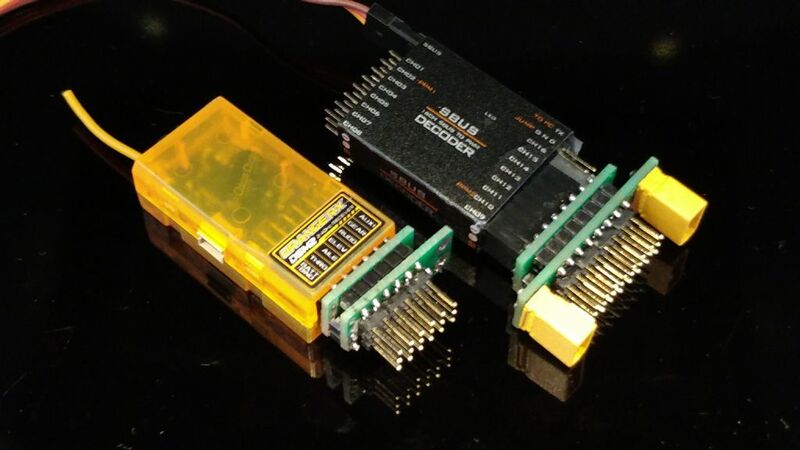 The photo with the PCB shows that they could be built to suit any number of channels and could be built as 1 or 2 port versions, with or without XT30s. Mods may be necessary to accommodate receivers with sockets in odd positions, but this is only a concept just now, after all. Chris W - these are XT30 connectors. I've added in an XT60 to a photo below for comparison. I did wonder if using XT30 poses a safety issue because an unused port does have exposed pins? Maybe there's a cover that could be attached? I understand all your other points but really don't want to end up designing what's already available on the market. Here we are plugged into a Spektrum Rx. Obviously this one could have an XT30 and could have two power ports.. The PCB shows how I've had them made. They cut up along the rows of large holes. XT30 and XT60 connectors for size comparison. If you send me one of the boards, I can measure up, design and print some cases for them. Looks great! A thought on Rx brownouts. You could use a schottky diode feeding the power to the Rx, then include a (large value?) capacitor on the Rx side to keep supplying power to the Rx if the power rail does dip. As always, adding this makes everything larger and more complicated, but may be useful if you are concerned about brownouts. Andy that's a great offer, thanks. Maybe we'll decide on any changes first? I'll PM you about it anyway. Mike I really like your idea. I wonder if the best incarnation is going to be a single supply unit, with a diode/capacitor built in at the other end. If anyone want's battery redundancy, that could take the form of a Y lead with the XT30 on the end of that. Fortunately I don't have such a problem. 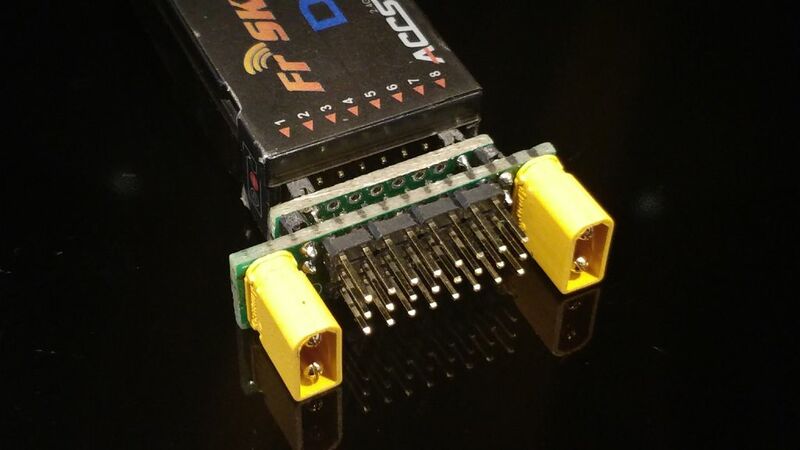 Multiplex have fitted M6 high current connectors to their Pro receivers since their introduction almost a decade ago. 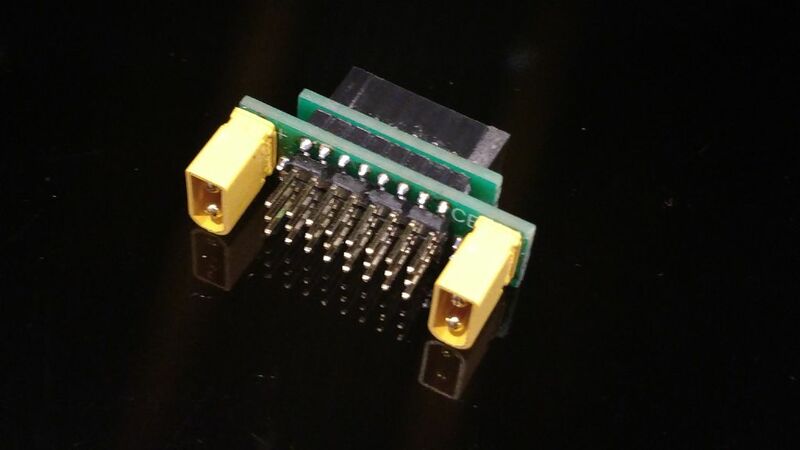 These connectors can accept Multiplex's own Safety Switch harnesses, or indeed a Powerbox harness. You can of course simply use the standard UNI connectors if you wish, as there are several power inputs using those too. Ooh thanks Harry. Clearly there's nothing new, is there? Are these available in other versions anywhere, for different types of receiver? They look specific to just the Futaba 6014 receiver? This particular one seems to solve three issues not just the worry of a good solid power connection for the servos. 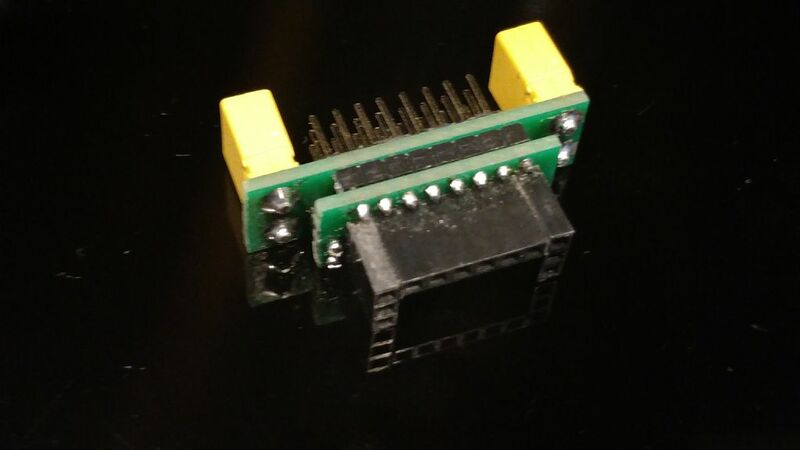 It allows higher voltage servos to be used with the receiver that maybe has a limited supply range? i.e. this has "double voltage regulators for the receiver". It also appears to raise the signal voltage for the servos from 3v to 5v. So it will help with "fussy" servos and will help with long servo cable runs. It looks a very capable unit and I really like the look of the precision connectors where it plugs into the Rx. Does anyone know where they're available from? Percy that's the sort of thing I meant when I suggested that my unit might be a "solution looking for a problem". But then, the excellent looking receivers that you show, and the Spektrum powersafe ones, are ideal for the level of model that justifies the expense. 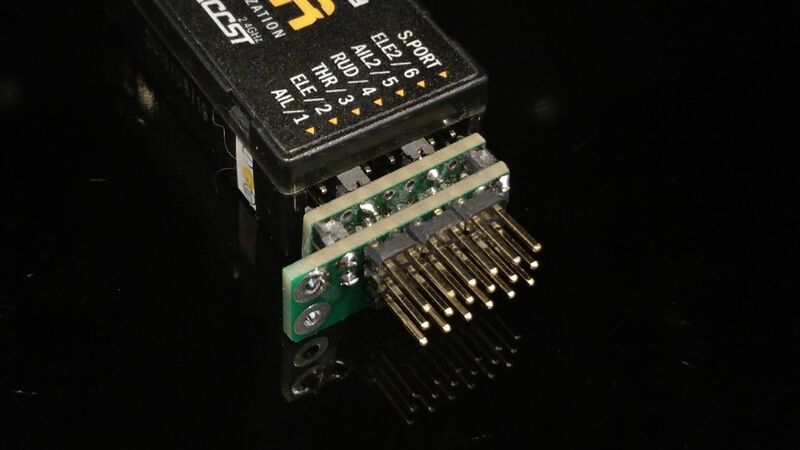 I'm only wondering if there's a need for something very simple.Or maybe we could find a way to prompt more manufacturers to market receivers with a decent power connector.